I recently finished my first book of 2015. I always like to kick of my 52 books in one year goal with an inspiring read and Slaying The Debt Dragon: How One Family Conquered Their Money Monster And Found An Inspired Happily Ever After by Cherie Lowe of Queen Of Free did not disappoint. Our family has been 100% debt free including our mortgage for several years now, but I still love reading of others journey’s to debt free. No two stories are the same. If you are currently struggling with debt and you need a push in the form of an inspiring story to get you going, Slaying The Debt Dragon is a book for you. If you need some advice from someone who has been there, Slaying The Debt Dragon is the book for you. 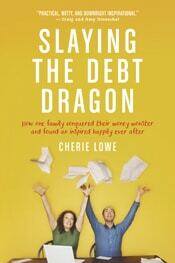 If you are 100% debt free and need an inspiring story to keep you there, Slaying The Debt Dragon is the book for you. Within the book Cherie shares many great tips on saving money in all areas of your finances, one area that she touched on was grocery shopping. She called her tips the “Grocery Store 10 Commandments”. I loved this challenge so much I decided to take Cherie up on it and make my own. Got to admit it was hard to come up from ones that were unique to the excellent 10 Cherie shares in her book. A calculator and and pen always come in handy in the grocery store for comparing prices and crossing off things on your list as you find them so you don’t forget an item and have to drive to the store again. Which, brings me to another tool you need, a grocery list. Creating a menu does not have to be complicated. Take a piece of paper write dinner on it and numbers 1 through 7 then do the same for lunch. Chances are you eat the same thing over and over for snacks and breakfast so you can add the items you need for those to your list with no need to make a plan. Go through your cupboards, if you have tuna and macaroni write down “tuna casserole” as a dinner idea and put other items you need to make it on your grocery list. Repeat this 7 times for lunch and dinner and you have a plan and a good start on your grocery shopping list. Okay so I am sort of altering this one from Cherie who used Thou shalt use coupons as her number 10 in her list in Slay The Debt Dragon. Coupon apps contain more than just coupons for processed food. They often have offers for fresh fruit and vegetables, milk, eggs and other staple items. Plus apps like Berry Cart have gluten free coupons for those of you with allergies. Of course printable coupons are still a great way to save money as well. I have slipped in this area lately and need to get back on track. Keeping a price book is vital to saving money at the grocery store, especially for saving money on staple foods to your diet. For instance our family discovered years ago thanks to our price book that we could save $80 a year on yeast for our bread machine recipes if we switched to buying it at Sam’s Club instead of in the little jars at our local grocery store .That pays for the membership at Sam’s and then some, plus by having a membership we save on other items. At least once a season hold an eat what you got week. These weeks will test your cooking creativity, give you a deeper feeling of gratitude for the food budget you have, and give you wiggle room in your grocery budget to stock up on rock bottom items. Here is an alternative to a whole week of no grocery shopping that has worked well for my family. Put down those individually wrapped cheese sticks and buy a brick of cheese and spend under 5 minutes chopping it up and wrapping it for snacks and lunches, same with baby carrots , a one pound bag of carrots is usually cheaper and it doesn’t take that long to peel and cut them. My family planted our first square foot garden last year, and I was surprised how many tomatoes, cucumbers and green beans we got out of it. Enough to eat and a few meals worth to freeze, and we only have a small backyard. We have plans to expand next year. I highly suggest the square foot garden book for all those wanting to start a garden in a small space or a big one. Sometimes the best deal for food is not found in the grocery store. I buy some of our organics at big lots. I shop Lucky Vitamin online for my vitamins and endurance products for my long runs. I also buy several items on Amazon because my local grocery store does not stock these items and I don’t want to spend the gas money to purchase them else where. When you shop with a list and a plan you shouldn’t need to go to the grocery store more than once a week. I have read about some people who only grocery shop once a month, making just small short trips in between for fresh fruit, veggies and milk. Figure out what works best for your family and stick to it. Fewer trips equal fewer “saw it and had to have it” purchases that can really blow your budget. Read the book that inspired my list, and be inspired to pay off debt. What grocery store commandment would you add? This sounds like a book I need to read. We are still on the journey to paying off all of our debt but making good progress. Your # 6 & 7 are a couple of my favorite methods for saving money. It always seems to taste better when you make it from scratch and it always amazes me what we can come up with to eat from what is already in the house. I hope your debt slaying goes well this year. I agree there is usually always something to eat in the house even when we think there isn’t . My children and hubby are always saying there is nothing to eat, and within seconds of looking in the cupboards I can come up with 3 options for them. LOVE this! Excited about the book; saved it to my amazon wishlist! We are in the process of slaying that dragon and have made big waves over the past year. I struggle most with Commandment 10 – I need a restraining order from Target! Skip a trip is such a great tip! I have started doing that and it’s especially helpful if I skip a Target run. I’m the kind of person who goes grocery shopping without any sort of plan. If I’m making a specific meal, I’ll only shop for whatever ingredients I need. I rarely have the ingredients I need at home and therefore I make multiple trips to the grocery store on a weekly basis. Thanks for your tip on grocery shopping as infrequently as possible. It’ll be very helpful to focus on planning my meals beforehand and also save money in the process. Yes, meal planning makes a huge difference. It really does cut down on “see it, want it, buy it” shopping.